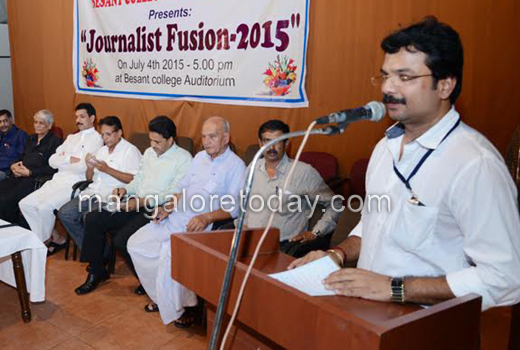 Mangaluru, July 5, 2015: The Karnataka Journalists Union in association with the Department of Journalism of Besant College organised a convention of journalists -’Journalists Fusion-2015’, at Besant Women’s College on July 4, Saturday. Dakshina Kannada MP Nalin Kumar Kateel inaugurated the programme. Speaking on the occasion, Nalin exhorted journalists to maintain transparency. He also praised the media for exposing various scams and said the works of journalists must reflect the society and its problems. Technology has in a way brought drastic changes in the way the media functions,he said and also delved on factors that have led to commercialisation of media. AB Ibrahim, Deputy Commissioner who was present as a chief guest stressed the need for journalists to maintain their integrity. He also regretted the fact that print media has been affected to some extent due to the presence of a large number of web news portals. S Jayaram of Doordarshan, Ahmed Anwar, photojournalist, Gangadhar Matty, newspaper distributors Anantaraya Bhat and Taranath Shetty were honoured on the occasion. 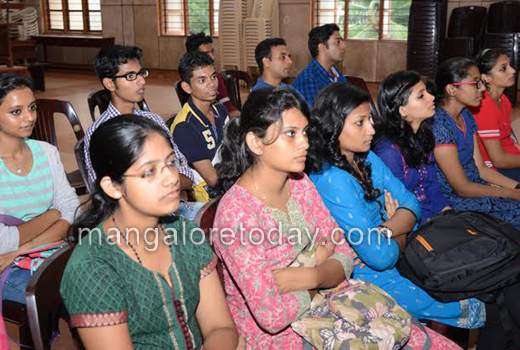 A talk on evolution of visual media was delivered on the occasion by S Jayaram. Jagannath Shetty Bala, President of DK District Working Journalists Union, Kishan Bal Pandith, President of Karnataka Journalists’ Union and many others were present on the occasion.